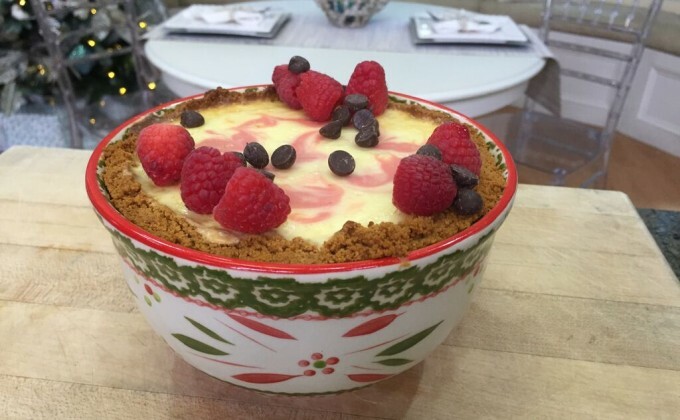 Want to know my secret for making a lighter, fluffier cheesecake? Just beat it! Your egg whites, that is. When you beat egg whites to stiff peak and gently fold them into the cream cheese mixture, the air trapped within the egg whites adds both volume and lightness. You'll never want to make a cheesecake any other way after trying this simple trick. Separate eggs; let stand at room temperature for 30 minutes. Place a greased 9-in. springform pan on a double thickness of heavy-duty foil (about 18-in. square). Securely wrap foil around the pan. Preheat oven to 325 degrees. In a large bowl, beat cream cheese until smooth. Beat in milk and vanilla. Add egg yolks; beat on low speed just until combined. Remove 1 tablespoon; stir into raspberry puree. Remove half the remaining mixture to another bowl; stir in cooled chocolate. Bake 55 - 65 minutes or until center is just set and top appears dull. Remove springform pan from water bath; remove foil. Cool cheesecake on a wire rack 10 minutes; loosen edges from pan with a knife. Cool 1 hour longer. Refrigerate cheesecake overnight. Remove rim from pan. Place cheesecake on a temp-tations cake plate. Garnish with additional raspberries if desired.